A key feature of any traditional bathroom scheme, nothing says timeless elegance quite like a roll top bath. But which one to choose? From luxury cast iron tubs to the more affordable fibreglass designs, to reclaimed originals and customised finishes, we've rounded up our favourites to help inspire your next bathroom refresh. Designing a traditional bathroom from scratch? Make sure you have a read of our guide for all the practical advice you will need. If you’re designing a small bathroom the Tubby Too bath from Albion Bath Company is the perfect solution. It is 147cm in length rather than the standard 170cm, ideal for this thatched cottage. Made from Albion's Iso-enamel material, it is pictured in a burnished gold finish, but is also available in bronze, silver and painted in any Dulux or Farrow & Ball shade, from £2,091. Whether you're adding an en suite bathroom, squeezing a tub into a master suite or tucking a neat and compact bath into the corner of a bedroom for a touch of boutique hotel luxury, look no further than Albion Bath Company's Tubby Tub. Here, it has been painted in Dulux's Firecracker 2 shade to complement a traditional period scheme. Custom painting your tub, as has been done in this bold bathroom scheme, is a great way to achieve a unique look. This cast iron roll top from Aston Matthews was painted in Dulux's Tangerine shade to complement the vintage floral wallpaper. Find the best bathroom paints in our buyer's guide. Baths don't come much more luxurious than this Bateau roll-top from The Water Monopoly. A reproduction of a late 19th-century French double ended bath with a plinth base, it is perfect for creating a feel of period grandeur, especially with this polished finish. When buying a cast iron bath always check your floor first, often floors in old homes will need to be specially reinforced to support the weight. If you have the space, a freestanding bath with floor mounted taps makes a great focal point in a bathroom. With one high end ideal for sitting back and relaxing in after a long day, this Astonian Slipper bath from Aston Matthews has an indulgent, elegant feel and costs from £1,911.95. Find more wall panelling design ideas and advice in our guide. To complement their country-style interiors and give their freestanding roll top a unique twist, the owners of this bathroom cleverly decoupaged the outside of their tub in pieces of Peony & Sage's Fleur fabric. 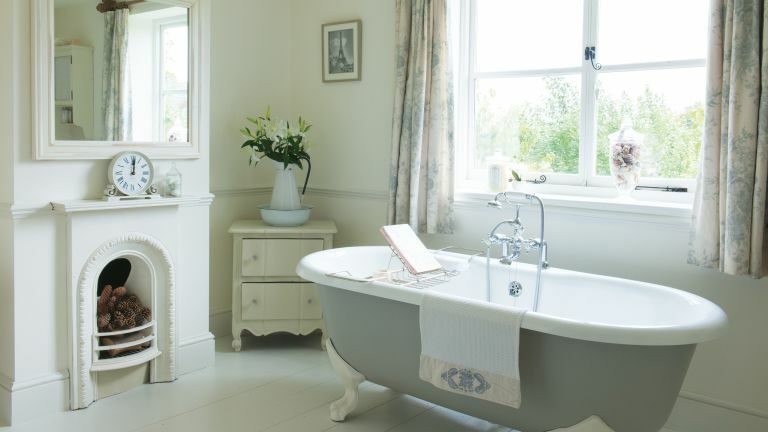 Passionate about antiques and original period features, the owners of this bathroom chose a reclaimed cast iron bath for their farmhouse and painted it a delicate grey shade to complement their French-style interiors. When painting reclaimed baths, water-based paints are not recommended; instead, try an oil-based version such as a satinwood or eggshell for the exterior. Find a similar reclaimed bath at Antique Bathrooms of Ivybridge. To create a show-stopping focal point in your bathroom, why not give your tub a bespoke finish like this burnished, weathered patina? For a similar look, paint the outside of the bath with Annie Sloan Chalk Paint in Florence and then apply copper leaf over the top. To finish, seal the exterior with Annie Sloan Clear Chalk Paint Wax. With its accentuated curves and classic claw feet this Devon cast iron, double ended bath from Heritage Bathrooms is the perfect design for a glamorous bathroom. For extra wow-factor, why not paint it in an opulent hot pink like this Summer Surprise shade from Dulux? Love this botanical wallpaper? We have plenty more for your to choose from in our gallery. Made from acrylic rather than the classic cast iron, but with the same timeless style, this Dulwich roll top from Victoria Plum is a great budget option for the owners – both first time buyers – of this Nottinghamshire cottage. When you have a home awash with beautiful features, sometimes a more subtle design is the way forward. With a simple, understated silhouette, this Orchard Warfe freestanding bath from Victoria Plum allows the striking stained glass window to take centre stage. See more contemporary freestanding baths like this in our design gallery.